Carolina Farms Home #3 is the site of a twice weekly “Cooking Zone”. 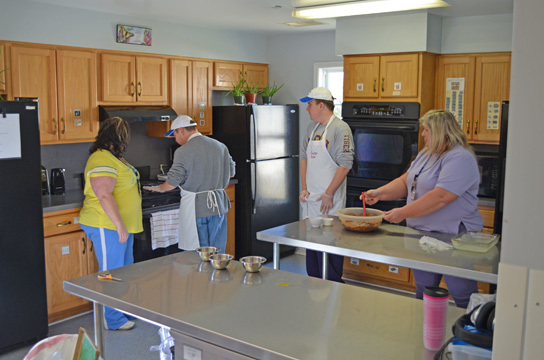 Residents from all three houses at the Farm get together on Tuesdays and Thursdays to make or bake and enjoy all sorts of goodies and treats. Farm fresh eggs, herbs, fruits and other in season produce are used to make an assortment of tasty recipes. 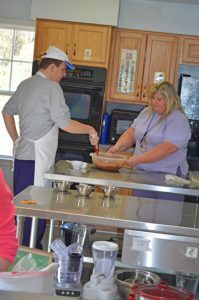 Birthdays at the Farm are celebrated with cupcakes, made by Cooking Zone participants, and seasonal holiday delights are also part of this program’s distinctive menu offerings. Everyone works together to complete various steps in the baking or making processes, and GHA support staff work closely with the participants, to ensure proper hygiene, as well as safe appropriate kitchen and cooking practices are learned and followed.